The Florida CCIM Chapter District of the Year is awarded to the District that shows exceptional accomplishments in membership growth, quality of events and fiscal responsibility. The Florida CCIM Chapter consists of eight Districts statewide. The Southwest District was named District of the Year for 2018 at the Chapter’s recent statewide Mid-Winter Meetings in Orlando. “As a resident of the region, it was an especially proud moment to award the Southwest District as the District of Year,” said Adam Palmer, the 2018 Florida Chapter President, “The leadership from this District worked endlessly towards making CCIM better and their ability to rank first in each of the criteria set is indicative of successful of a year it was,” explained Palmer, CCIM, the Principal and Managing Director for LandQwest Commercial Real Estate Services. Bev Larson, 2018 District President was equally thrilled. 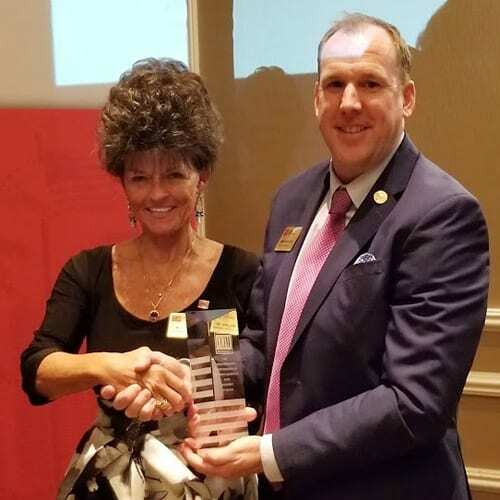 “I was honored to be a two-time President of the Southwest District of the Florida CCIM Chapter, once in 2015 and again in 2018. It is very exciting to be recognized and have the District awarded District of the Year. We believe the growth and success achieved in 2018 comes from a strong leadership team, educational excellence, and outstanding networking and event opportunities offered to our membership,” Larson added. Bev Larson, CCIM, also invited fellow CCIM’s to attend the 19th Annual Southwest Florida CCIM District Commercial Real Estate Outlook Conference coming up on February 11th at the Hyatt Regency Coconut Point in Bonita Springs, Florida. The Southwest District serves the Charlotte, Glades, Lee, Hendry, and Collier counties.